It is late summer in the year 1270 and England is as weary as its aging king, Henry III. Although the Simon de Montfort rebellion is over, the smell of death still hangs like smoke over the land. Even in the small priory of Tyndal on the remote East Anglian coast, the monks and nuns of the Order of Fontevraud long for a return to tranquil routine. Their hopes are dashed, however, when the young and inexperienced Eleanor of Wynethorpe is appointed their new prioress over someone of their own choosing. Nor are Eleanor's own prayers for a peaceful transition answered. Only a day after her arrival, a brutally murdered monk is found in the cloister gardens, and Brother Thomas, a young priest with a troubled past, arrives to bring her a more personal grief. Now she must not only struggle to gain the respect of her terrified and resentful flock but also cope with violence, lust and greed in a place dedicated to love and peace. During the dark morning hours of a winter day in the year 1270, an aged prioress realized she was dying. To her surprise the dying was much easier than she had ever imagined. The crushing pain in her chest was gone and she felt herself drifting upward with an extraordinary lightness. She was floating above the rush-covered floor, over which a dusting of sweet-scented petals had been scattered, and away from that narrow convent cot where her earthly remains lay so still. Indeed, she wasn't frightened. She was very much at peace. With its intriguing plot, chilling conclusion and characters who exhibit universal and timeless feelings, this fresh first has all the potential to evolve into a series as enduring as Ellis Peters's Brother Cadfael books. Priscilla Royal's stellar debut is a compelling combination of mystery, intrigue and medieval history. Royal has a fresh narrative voice, an impressive ear for dialogue and a keen sense of history. Find a comfortable chair and plan to stay up late. Highly recommended. ....gripping, with an excellent plot and wonderfully realized characters. I picked it up on a long journey and could not put it down. Wonderful read. ...a fascinating look at medieval life in the year 1270 during the reign of King Henry III. Readers read about sexual predators enjoying the largesse of the Catholic Church and how secular choices are made for religious appointments. Priscilla Royal is a talented storyteller entertains and educates her audience with this regal historical. Lovers of historical mystery will relish this chilling Victorian tale based on real events and cloaked in authenticity. Best of all, it casts British literature's most fascinating and controversial figure as the lead sleuth. 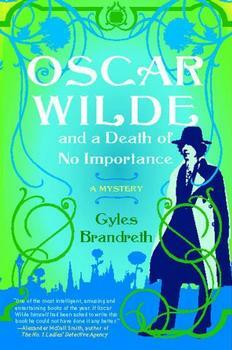 (UK title: Oscar Wilde and the Candlelight Murders). Published in the USA simultaneously in hardcover and paperback.